At the end of January I was lucky enough to go to React conf at Facebook HQ in Menlo Park. This was my first tech conference, and it was a great and inspiring experience for me. The talks were excellent and I recommend everybody check out the videos, but the talks that really stole the show were the ones on React Native. This is a really exciting development for the native app world, and gives a new perspective on what native app development could be. I’d previously tried to learn iOS development a couple of times, first with Objective-C, and later with the introduction of Swift. Whilst I think Swift is a massive improvement in iOS development, I still ended up getting bored and life got in the way of learning this new system. So initially, the idea of using my current skill set in React web development to build truly native apps was extremely enticing (and still is). I generally believe that as a developer you should pull your finger out and learn the language that suits the job, but in this instance React Native seemed to offer more than just an easy way into iOS development. It offered a simple and fast way to build interfaces and to manage application logic, and the live reloading of an application in the simulator without recompiling blew my mind. Luckily for me, conference attendees were given access to a private repo with React Native source code inside, so I began playing as soon as I got back to my hotel room. Within 5 minutes I was modifying one the provided examples with ease without any extra iOS development knowledge, and I was hooked. Since then I’ve been leveraging my early access to talk publicly about React Native to some great reception. It’s been fascinating discussing this with people in the community because I hear very little scepticism and a lot of excitement from web developers and native developers alike (at least those that come to a React meetup). This is still a hugely important advantage, but it isn’t the major benefit and doesn’t highlight what React Native offers over competing frameworks. It also doesn’t perfectly align with my view that looking for a tool or framework just to reduce the need for learning another language is lazy thinking. There’s more to React Native than this. React Native’s biggest feature is React. This may seem a bit obvious (the clue is in the title) but let me explain. When I first looked at React I thought it was insane like most people. It takes such a different approach to web development that it gives many people an immediate repulsive reaction. But of course the more I used it the more I realised I could never go back to building web applications (or any front-end app for that matter) any other way. 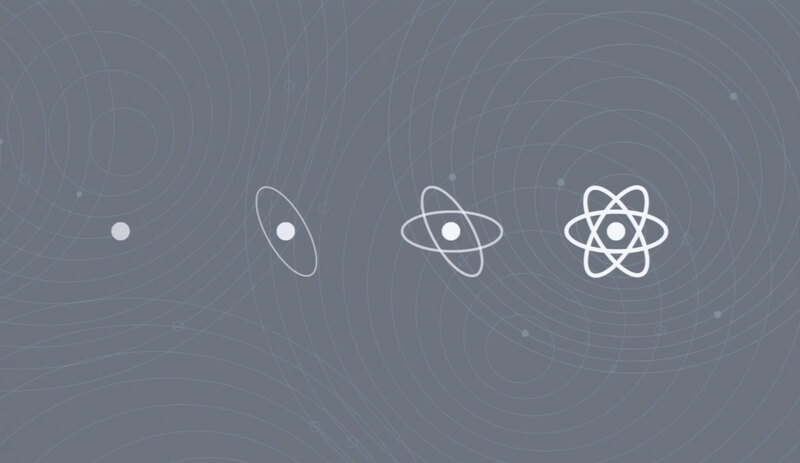 The patterns react provides are an extremely powerful way of building applications. If you haven’t used React much it might help to know that React lets you declaratively define what your view should look like given some input data. A react component is passed some properties that it requires to render a view, and as a programmer you simply define the structure of the view and where that data should sit. In doing this you’ve already done half of the work in building your application, because if a component or any of its parents changes their data (in the form of state), React will simply re-render the affected components given the new data. No specific data binding. No event management. No micro managing the view. Just change the data and watch React recalculate what your view should look like. React will then use its diffing algorithm to calculate the minimum possible DOM manipulations it can do to achieve the desired result. The second half of your application structure is of course user interaction. Patterns and tools like Facebook’s Flux and Relay help with this, but essentially these are just ways in which you can modify the data in your application in a neat and scalable manner. The application still simply recalculates the structure of the view once the data has changed. React really shines when you start to scale an application, because the complexity of your application doesn't have to increase too much. This is of course quite hard to demonstrate in a blog post, but I can give you an example of a simple little app written in angular and react that I adapted from Pete Hunt, one of React's creators. See the Pen RNBVZz by Robbie (@robbiemccorkell) on CodePen. See the Pen VYBbyN by Robbie (@robbiemccorkell) on CodePen. This is an extremely simple and powerful way to build front-end applications. It combines the best of both worlds in a simple and easy interface for the programmer, and a performant experience for the user. It’s for this reason more than any other that React Native is an exciting new tool in native app development. It changes the way a programmer thinks in building the front-end of their app. In the talk I mentioned above I demonstrated some of my ground breaking research in video game technology with a game I created that I call Tappy Button. 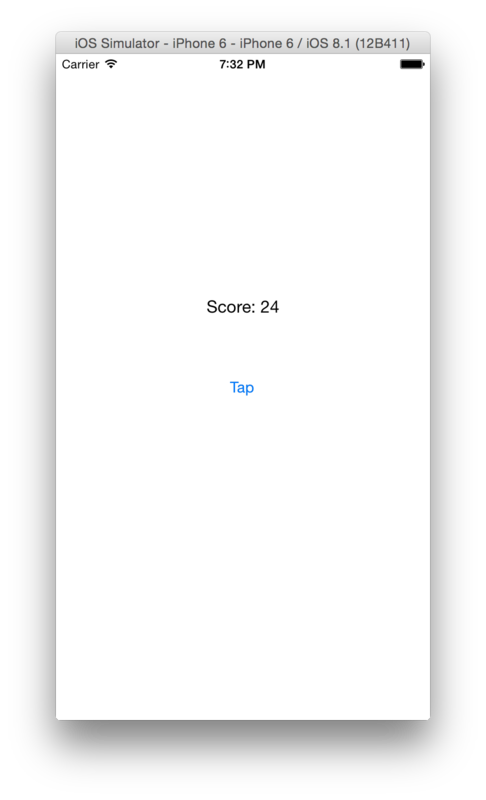 The objective of this game is to tap the button in the middle to increase your score. The sample code below defines the full application seen in the screenshot including view structure, styling and application logic. What you should notice here is that the code is extremely unremarkable. It’s the same kind of React we know and love simply applied to a native app context, and that is what’s so remarkable about it. The only differences to traditional React web development are the element names (1) and the inline styling (2). Building the same application in Xcode using Swift requires a similarly small amount of code, but it does require the developer to perform a process of clicking and dragging to create elements, constraints and method stubs in the code which quickly becomes tedious. As the application becomes more complex, the developer must manage collections of view controllers that manually update the view when required. But in React the view is declared once and all the developer must do is make sure the data inside each component changes when necessary. The important things in the future of React won't be more features, add-ons or utility libraries. Yes, some improvements, optimisations and structural changes will be built in down the road, but I don't think Facebook want to overcomplicate something that works so brilliantly and simply already. We already have React being applied to different areas with React Native, and at React conf Netflix announced they were taking a similar approach, even applying React to embedded devices like TVs using their own custom built rendering engine. We've also heard that Flipboard have swapped out the DOM in favour of canvas elements in their latest web app to impressive results. In the future, we are going to see React applied to many different areas of front-end development by simply swapping the DOM and browser out for another view structure and rendering engine, whether that be mobile and desktop native elements, canvas, embedded devices, or who knows what. This will allow developers to use the power of React and its development patterns in any environment. The two base elements we can work with are 'View' and 'Text' and which act as block and inline elements respectively. Coming from the world of the DOM, we can simply translate 'div' to 'View' and 'span' to 'Text' and we’re basically good to go. Any other elements like 'TouchableHighlight' are utility components provided to us by React Native’s component library. I think NativeScript could be an interesting way to build react native bridges to native APIs, and we'll be experimenting with this in the future. However, I’m still sceptical as to whether the overhead is worth it, and maybe if we want to build native bridges we should just learn the bloody language!